Dr Ayham Al-Ayoubi of London Medical and Aesthetic Clinic has led the way yet again by introducing the very first evolutionary SmartLipo Triplex from the USA into the UK and Europe in 2010. A new member to the laser lipolysis field, the SmartLipo Triplex, offers greater fat reduction and skin tightening and it is an improvement upon the SmartLipo MPX series. The Triplex adds another benefit to the original Smartlipo system with an additional wavelength. It is the first laser lipolysis technology that uses three wavelengths which are well absorbed by fat. The Smartlipo TriPlex laser is the latest generation of laser lipolysis workstations. 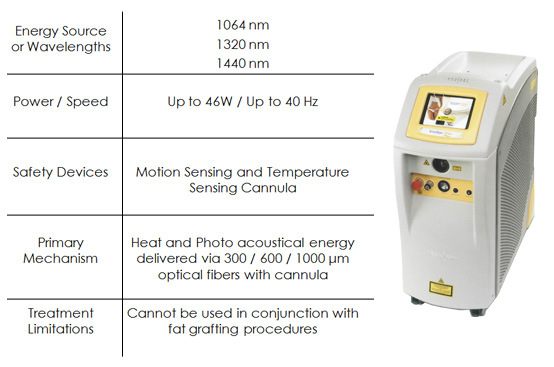 This new platform offers a solid state Nd:YAG laser capable of emitting laser radiation in three wavelengths: 1064nm, 1320nm and 1440nm. These versatile wavelengths can be used independently or can be uniquely blended using MultiPlex™ technology. The new and improved Smartlipo TriPlex design gives greater absorption in fatty tissue, the addition of the 1440 nm wavelength to Smartlipo significantly exceeds the performance of all diode lasers (924 nm and 980 nm). SmartLipo Triplex adds a 1440 nm wavelength to the MPX generation of the laser. The three wavelengths are combined in one laser output. Two wavelengths fire sequentially, liquefying the fat and tightening the skin with collagen stimulation. The 1064 and 1440 wavelengths combine for fat liquefaction and the 1064 and 1320 wavelengths combine for collagen stimulation and blood vessel coagulation. This combination provides both fat reduction and skin tightening so that patients can often avoid additional procedures to remove the loose skin people often experience after liposuction. Finally, we had a breakthrough; Smartlipo works by making a tiny incisions, under local anaesthetic, and then emulsifying the fat by rupturing the membrane of the fat cell using the light, not the heat, of the laser. 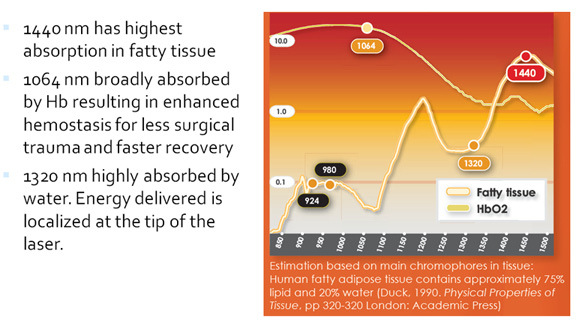 The contents of the fat cell leak out and the cell itself no longer has a function so is removed by the body. The first machine had six watt energy and was fantastic in small areas such as under the chin, and for small amounts of tummy or thigh fat but I had many patients wanting much larger areas dealt with. The machine wasn’t producing the results wanted and the length of the procedures meant discomfort for the patients.